Friday 6-Nov, 9am-12 [FAM2] OR 2pm-5pm [FPM3]. 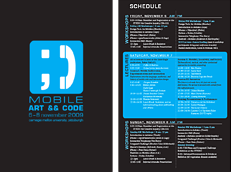 A rare opportunity to learn how it all works, this session is a soup-to-nuts overview of today’s mobile technologies, an explanation of all those mysterious acronyms and buzzwords, and a guided tour of some exotic and specialized fields. Learn from an experienced insider about the opportunities and possibilities for art, design and creative hacking! This workshop will describe the terminology, technology and creative tactics that can be employed in the production of mobile art and designed experiences. Through a survey of new as well as long-forgotten mobile art projects, participants will gain a top-level perspective on the technical details, conceptual structures and tactical interventions that make mobile contexts creatively supple. Practically, an overview of key mobile technologies will be introduced through several existing projects to lend context. This overview will include operating systems, voice and data control systems, proximity networking, positioning, digital world to physical world bridges, direction detection, acceleration data capturing and real world analytics. At the end of this workshop, participants will have an understanding of many of the core aspects of creating technology-based mobile art experiences. This workshop is for anybody! No special programming or other skills are necessary to participate, and no computers are required.